DE NIEUWE EN OBEKENDE WEERELD: OF BESCHRYVING VAN AMERICA EN 'T ZUID-LAND, VERVAETENDE D'OORSPRONG DER AMERICAENEN EN ZUID-LANDERS, GEDENKWAERDIGE TOGTEN DERWAERDS, GELEGENDHEID DER VASTE KUSTEN, EILANDEN, STEDEN, STERKTEN, DORPEN, TEMPELS, BERGEN, FONTEINEN, STROOMEN, HUISEN, DE NATUUR VAN BEESTEN, BOOMEN, PLANTEN EN VREEMDE GEWASSCHEN, GODS-DIENST EN ZEDEN, WONDERLIJKE VOORVALLEN, VEREEUWDE EN NIEUWE OORLOOGEN: VERCIERT MET AF-BEELDSELS NA 'T LEVEN IN AMERICA GEMAEKT, EN BESCHREEVEN DOOR ARNOLDUS MONTANUS. t' Amsterdam, J. Meurs, 1671. 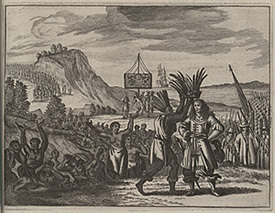 This large paper edition depicts the June 26, 1579 ceremony of Sir Francis Drake being crowned with an Indian headdress. "The chief who had arrived from further afield with a guard of about 100 men," presents Drake with the crown. The English explorer assumed that the Indians were surrendering all rights and titles to land and property, in effect becoming subjects to Drake and the English crown. This seventeenth century work describes the flora, fauna, and inhabitants of North and South America in great detail, and offers numerous illustrations to enhance the descriptions.